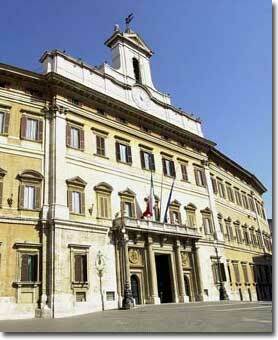 The Palazzo Montecitorio is located on the homonymous square. It was commissioned in 1653 by Prince Niccolò Ludovisi to Gian Lorenzo Bernini. The construction was interrupted in 1655 for the death of the prince, and after almost 40 years pope Innocenzo XII commissioned Carlo Fontana to perform the assignment and completion of renovation. In 1870 the palace became the seat of the Chamber of Deputies. The current parliamentary chamber, decorated by Sartorio and Calandra and paneled in oak, was added in 1903 to 1927 by Ernesto Basile. The main facade of Bernini is slightly convex. Clad in red brick and travertine presents insights naturalistic typically baroque. Only minor changes were made to it, by Fontana, useful for public office. The entrance consists of three adjacent ports divided by four Doric columns, the middle one is the greater and has a rectangular shape, while the side have an arc shape; above the triple portal has a loggia. Inside there are, in addition to the parliamentary chamber, the corridors called "the lost steps" and "The Transatlantic". All rooms are decorated with fine furnishings and works of art, ancient and modern. Are interesting also, the main staircase, the Hall of the She-Wolf and the Library, founded in 1848, with over 400,000 volumes. Ernesto Basile (Architetto) realizzò nel 1903-1927 i lavori di ampliamento del palazzo. Costruì un nuovo edificio alle spalle dell'originale mantenendo solo la parte frontale del palazzo berniniano. In questo nuovo corpo collocò l'attuale aula parlamentare. Nicolò Ludovisi (Principe) commissionò al Bernini nel 1653 la costruzione del palazzo. Antonio Pignatelli said Pope Innocenzo XII (Pontefice) affidò a Carlo Fontana, 40 anni dopo la la morte del principe Niccolò Ludovisi, i lavori di completamento e ristrutturazione. Davide Calandra (Scultore) eseguì il grande pannello bronzeo dell'Aula "La glorificazione della dinastia sabauda". Paolo Caliari said Veronese (Pittore) con la tela "Nozze di Cana" del 1582.
con la tela "Parigi di Notte"
Carlo Carrà (Incisore) con la tela "Inverno sul lago d'Iseo". Ottone Rosai (Pittore) con la tela "Vecchina". Lorenzo Viani (Pittore) con la tela "Donna". Mino Maccari (Pittore) con la tela "Danza di Donne". con la tela "Carretti siciliani"
Armando Spadini (Pittore) con la tela "Bagnanti e bambine". Massimo Campigli (Pittore) con la tela "Donna". Michele Desubleo said Michele Fiammingo (Pittore) con il dipinto "Incontro di Ulisse e Nausicaa". Pietro Novelli said il monrealese (Pittore) con il dipinto "Ritratto di filosofo (?)" databile nel periodo 1625 - 1647. Anonimo (Pittore) con il dipinto "Paesaggio con scena mitologica" databile nel periodo 1688 - 1714. The church of St. Ignazio was built in Baroque style. Its vast interior is inlaid with precious stones and marbles. It was built up by Francesco Borromini in 1642. It is considered the highest expression of Borromini's genius, and according to many people, it is the best baroque representation in Rome.